Until recently, only one column from the peristylion of the Temple of Zeus and two more from the entrance to the portico remained at their original positions, as the majority of the Corinthian columns that once graced the interior of the Temple of Zeus, were used for constructing the interior of a Basilica, built approximately 100 meters south of the temple. A few days ago, however, the scaffoldings placed for the reconstruction of the temple were removed and the Temple of Zeus appeared in different dimensions: with nine columns in their positions forming the north-eastern corner of the building, and two of them crowned by their epistylia and at a higher level by a triglyph. The realization of the project required many years and the efforts of many scientists, that succeeded one another. According to civil engineer and restoration consultant, Dr. Konstantinos Papantonopoulos, responsible for the last phase of the project, the reconstruction of the temple’s entablature, the fact that more than 70% of the temple’s original material survived was a critical factor that helped the reconstruction. However, the composition of the stones, with which it was built in antiquity, caused many problems, as this sort of psammitic limestone has a much smaller mechanical durability compared to marble and other hard limestones which were used for the erection of monuments. The ancient craftsmen were very well aware of this fact, and coated the columns and other architectural members to protect them from damage and decay. The limestone used in the project for the preparation of the new stones is extracted from a nearby area, very close to the ancient quarries. Mr. Papantonopoulos organized a pilot reconstruction in 2011, after preparing a study. The team is planning to reconstruct five more columns along the northern side of the temple, as the ancient material is preserved and a relevant study has already been conducted by architect Katerina Sklere. To proceed to this reconstruction, however, the team has to wait for the approval by the Central Archaeological Council and for the necessary funding. The reconstruction of the Temple of Zeus, a project of the Nemea Center for Classical Archaeology of the University of California, Berkeley, with head archaeologist Kim Sheldon, cost 765,515 euros for the years 2010-2012, while for the years 2004-2012 its cost was 2,506,945 euros. The new project will be postponed, due to the current difficult financial situation. Built c. 330 BC over the remains of an earlier temple, the Temple of Zeus lies in the center of the Sanctuary of Zeus at Nemea. The 9,240 square foot Temple played a significant role in the Nemea Games, one of the original Pan-Hellenic Games of Ancient Greece. 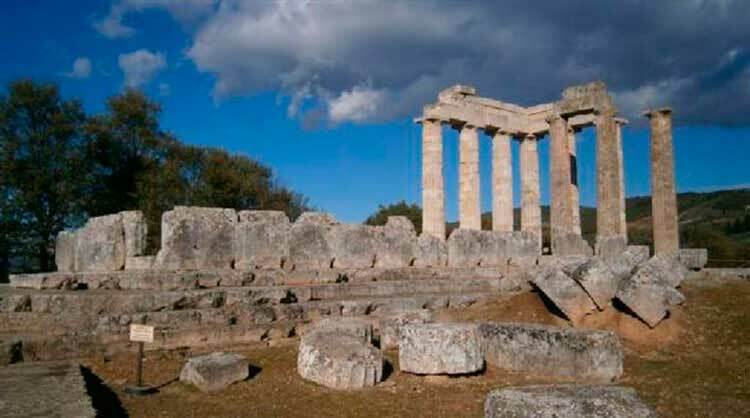 It was before this Temple that, prior to the Nemea Games, the athletes would pay homage to the father of their gods, Zeus. The Temple’s construction included three Greek architectural forms, the Doric, the Corinthian, and the Ionic. 32 limestone columns each standing 42 feet tall, and composed of 13 cylindrical stones, called “drums”, each weighing approximately, 2.5 tons, surrounded the Temple of Zeus. Of those 32 original columns, only three columns remain standing today, the rest gave way to nature, specifically, earthquakes and human intervention—the latter through looting and the removal of the Temple’s material to build other monuments.